Before leaving office, former NY Governor David Paterson directed NY Department of Environmental Conservation (DEC) to complete the SGEIS for high volume horizontal hydraulic fracturing in shale by June 1. Yesterday Joe Martens, new head of DEC, told AP that DEC staff would meet twice each week starting in April and "through the summer" to complete the final rules. The SGEIS is the "Supplemental Generic Environmental Impact Statement" that will supplement current gas drilling regulations with new rules for fracking in shale formations. The 809-page first draft was published in Sept. 2009 and opened for comments. More than 13,000 industry groups, environmental groups, lobbyists, municipal representatives and residents sent comments to DEC, and the agency is still trying to sift through the mountain of paper (and email). Martens told AP that Paterson's June 1 date was more a guideline and less a deadline. He said the work would likely continue through the summer and verified that there will indeed be a public comment period of at least 30 days. Maybe longer, because the revisions are extensive and Martens feels they may need to allow more time for comments. As for pressure to hurry on the permits, Martens told AP that DEC "will only deal with the number of permits that we have the staff to handle." He promised that if the agency can only process 10 permits a year, then that's what they'll do - even if 150 applications are sitting in the queue. Cornell professor Robert Howarth reports that emissions from shale gas development are much higher than conventional drilling and likely to aggravate global warming. Working with Tony Ingraffea and Renee Santoro, Howarth spent the past year calculating the total contribution of greenhouse gas emissions generated from unconventional drilling. Their research will be published this April in the peer-reviewed journal, Climate Change Letters. A couple weeks ago the researchers discussed the numbers behind their findings during a lunch-hour seminar. Although no one has definitively calculated the contribution of greenhouse gases from gas drilling, their numbers show a big difference between conventional and unconventional drilling. Turns out that drilling shale gas wells puts anywhere from 30 percent to twice as much carbon into the atmosphere as conventional gas wells. That’s because unconventional gas wells are bigger, says Ingraffea. Longer horizontal wellbores mean more drilling time and heavier drilling equipment, which means burning more diesel. Add to that more fracking stages and more cement plugs in the horizontal bore – plugs that must be removed before the gas flows. Bigger wells also mean more flowback and more produced drilling fluids. And at every one of these stages carbon is lost, mostly in the form of methane that released into the atmosphere either through venting or by flaring. The Cornell team used data from Chesapeake wells drilled in Pennsylvania Marcellus shale to characterize a “typical shale gas well”. Then they determined how much carbon was emitted from each stage of drilling and production. Carbon dioxide emissions are important, Howarth said, but methane is a more critical problem. Natural gas is 85 to 95 percent methane, a far more potent greenhouse gas than carbon dioxide. 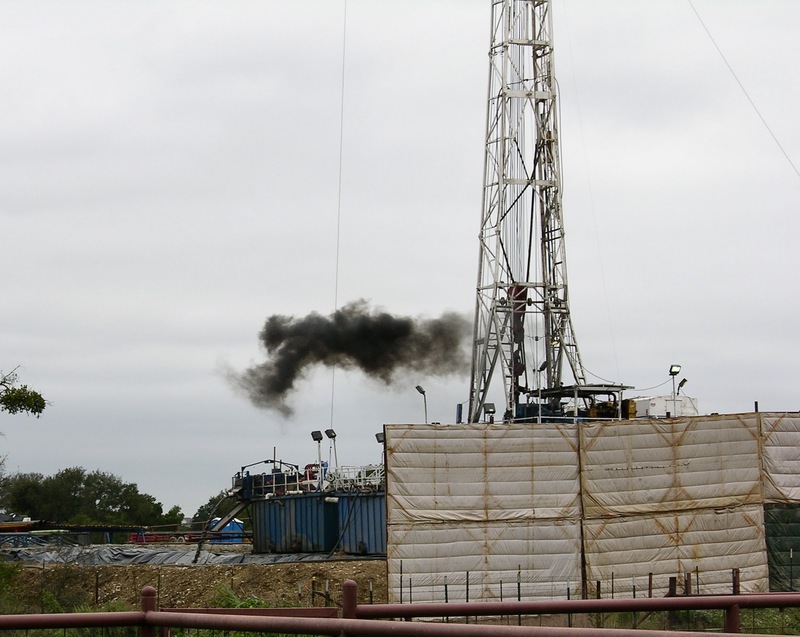 No one has measured actual methane emissions from gas wells throughout the various stages, so the Cornell relied on data from the gas industry, the General Accountability Office and EPA. “A shale gas well can lose up to 3.2 percent of its lifetime production of methane in the first 12 days,” Howarth said. The amount of gas vented during initial drilling activities varies with the rock formation, so the team calculated an average using industry data from five different formations. Even with their conservative estimate, the Cornell researchers figure that 1.9 percent of a shale well’s lifetime methane production escapes during initial drilling and completion. For conventional gas wells that figure is 0.1 percent. That difference, says Ingraffea, is due to hydro-fracking. 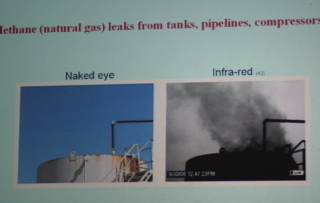 Once a gas well begins producing, gas continues to leak at the well site, said Howarth. This holds for both types of wells, with little difference between the two. Additional methane is lost during processing, and even more when gas is vented from storage tanks and lost from pipelines. Just how leaky are Amaerica’s aging gas pipelines? According to Texas companies operating in the Barnet shale, 3.6 percent of the gas shipped through pipelines never makes it to the end consumer. When you tally up all the numbers from drilling to production to transport, something like 3.6 to 7.9 percent of the gas from a shale well disappears into the atmosphere over the lifetime of the well. 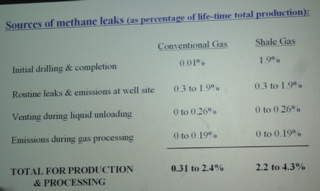 That amount is 30 percent to two times greater than the amount lost during conventional gas production and development. All the methane that is vented and flared during gas drilling ends up in the atmosphere where it contributes to global warming. The question, Howarth explained, is how to translate methane emissions into “carbon dioxide equivalents” Previously, scientists multiplied the amount of methane by 21. The Cornell team believes that multiplier should be much higher. Their conclusion: shale gas contributes twice as much greenhouse gas as coal. Last night the Village of Owego board of trustees voted to halt negotiations with Inflection Energy. The only dissenting vote was Mayor Ed Arrington. At the end of last year the village board was considering whether or not to sell treated wastewater to the energy company. Inflection had offered to purchase up to 200,000 gallons of effluent at 5 cents/gallon - bringing potentially $3.6 million into the village coffers. But in order to sell the effluent, the village had to upgrade the facilities at a cost estimated near $400,000. At least those are the details that were made public - the village has consistently denied FOIL requests by this reporter and others for documents relating to the proposed deal. While Arrington thinks the Village is losing a huge opportunity to bring in needed funds, village trustees see things differently. The money was never a sure thing, says trustee Jim Legursky. In a telephone conversation this morning he said that the proposed contract included a line stating that "nothing would obligate Inflection to buy water." "The concept [selling wastewater] is great, and the village trustees are open to selling effluent," Legursky said. "But under the right contract." For now it looks like the deal is off the table. You can read earlier posts on the proposed sale here. Two years ago faulty cement casings of gas wells in Dimock, PA led to the contamination of water wells in one part of town. But the impact of drilling goes far beyond that, Victoria Switzer told a small crowd in Binghamton NY on Monday night, March 14. Switzer is one of the residents living in Dimock’s “affected area” – it’s an official designation by the Department of Environmental Protection (DEP) she said. After her neighbor’s well exploded, Switzer and others noticed methane in their water. She showed a graph plotting the peak methane levels in the groundwater that she and her neighbors depended on for drinking, cooking and washing. Cabot Oil and Gas, the company responsible for the gas wells, supplied affected homes with drinking water, filling large plastic containers called “buffaloes” and providing bottled water for drinking. But the families continued using their well water for other things. 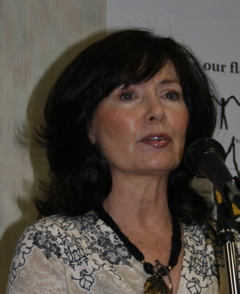 Then, 15 months later in April 2010 Switzer noticed that her groundwater looked “soapy”. She asked an independent lab to run tests and the results showed ethylene glycol, propylene glycol and toluene present in her well. “I was lucky that I tested my water before they began drilling,” Switzer said, so she had data to back up her assertions that prior to the explosion her water was methane-free. Water tests don’t stop contamination, but they provide evidence that, in the case of Dimock residents, was needed to compel the gas company to provide drinking water. The problem, Switzer says, is that we can’t live on bottled water for the rest of our lives, and the PA DEP isn’t forcing the gas company to provide a permanent solution to the neighborhood’s water woes. If you can't Regulate Fracking, Can you Ban It? Can towns ban fracking? That's the question residents in Dryden, NY are hoping to answer soon. Since December, members of the Dryden Resource Awareness Coalition (DRAC) have been knocking on doors and asking their neighbors to sign a petition that would ban slick-water hydro-fracking in the town. After explaining how the heavily industrialized drilling practice has impacted communities in other states – snarling traffic, damaging roads and bridges, and hurting tourism, agriculture and hunting – the residents petition the Town Board to ban slick-water hydro-fracking in the Town of Dryden. You can read the whole thing here. So far, DRAC members report that people are eager to sign the petition, and many residents are asking for more information about drilling and hydro-fracking. 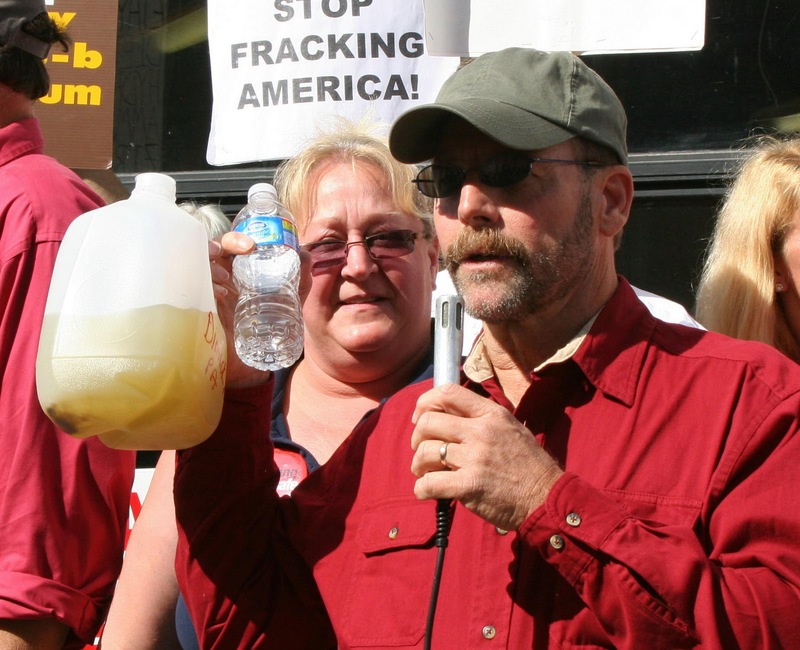 Can towns ban fracking? Buffalo has. Now the move to ban fracking seems to be spreading across the state. Ulysses and Caroline, also in Tompkins County, are considering a frack ban. And earlier this month three towns in Otsego County – Middlefield, Otsego and Springfield – announced that they are moving to ban or restrict natural gas drilling and high-volume hydraulic fracturing. While state environmental laws prohibit towns from regulating drilling and mining practices, they do allow towns to zone. And that, says McRae, is what towns are doing. Banning is not regulation, she says. It’s like zoning – you’re just keeping it out. Recent articles in the New York Times about radioactivity found in Pennsylvania rivers caught people’s attention, said McRae. She’s hoping the increased awareness of potential drilling problems will translate into more support for the town’s frack ban. Hard as it is to believe, the general public isn’t rushing to embrace the oil and gas industry’s message that hydraulic fracturing is safe. And that lack of enthusiasm has industry officials worried. A couple weeks before the New York Times expose on fracking hit the newsstands, Colorado Oil & Gas Association president Tisha Schuller told industry representatives that their public relations strategy wasn’t working. Schuller spoke at a conference that was part of this winter’s NAPE expo in Houston. Tom Fowler, business energy reporter for The Houston Chronicle reported on this huge expo that draws attendees from oil-patch regions across the world. During the February 16 conference on unconventional drilling and regulations, he quoted Schuller saying that it’s time for the industry to shift strategies. They need to try something different from their continuing argument against tighter regulations, she said. They need to quit repeating their timeworn claim that fracking hasn’t caused drinking water contamination. “It’s not working if you give the impression that we don’t want to be regulated at all or think we should be able to operate however we please,” Schuller said. A better message would stress that the drillers, truck drivers and others working in the industry “live, work and play in the same communities” as everyone else and value clean air and clean water just as much as their neighbors. Schuller added that companies need to highlight what they do right. Point out the key areas in the operations where fracking can pose a threat, such as surface spills and casing failures, she told industry officials. Then explain what you are doing to assure those operations are conducted in a safe manner. The recent NY Times series on fracking got everyone’s attention. This morning the Pennsylvania Department of Environmental Protection (DEP) announced that river water downstream of Marcellus water treatment plants is “safe” – at least according to results from in-stream water quality monitoring for radioactive material in seven rivers. “All samples showed levels at or below the normal naturally occurring background levels of radioactivity,” Southwest Regional Office spokesperson Katy Gresh wrote in the press release. The tests were conducted in November and December of 2010 at stations downstream of wastewater treatment plants that accept flowback and production water from Marcellus Shale drilling. The press release did not list the test results and gave not links to documents. Nor did DEP compare how the levels they tested compare to federal drinking water standards. Krancer did say, however, that the sampling stations were installed last fall specifically to monitor stream quality for potential impacts of Marcellus development. You may read the DEP release here. This past week’s excellent "Drilling Down" series in the New York Times has done a lot to focus media attention on problems associated with industrialized drilling and hydraulic fracking in Marcellus shale. 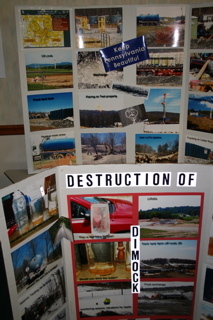 Meanwhile people living in drilling-impacted areas continue to live with exploding condensate tanks (most recently the MarkWest compressor in Washington County, PA on March 1), leaky gas pipelines and contaminated drinking water. The problem, say residents living in those areas, is that news stories fail to accurately reflect what is happening. Take Dimock, for example. Dimock, lest you’ve forgotten, is a sleepy hamlet just south of Montrose in Susquehanna County, PA. Instead of quiet wishes for a prosperous New Year, the first day of January in 2009 opened with a bang for some residents. A gas well explosion blew off a well cover, alerting residents and regulatory officials that there was a problem underground. Less obvious were the bad cement casings in several wells in the area, poorly constructed casings that allowed for methane migration and contamination to private wells that provided fresh drinking water to about 14 families. After investigating, the PA Department of Environmental Protection (DEP) ordered Cabot, the company responsible for the wells and the explosion, to provide a permanent solution for getting water to the affected homes. Little happened and last fall DEP promised to build a water line to provide residents with fresh drinking water, at Cabot’s expense (an estimated $11 -12 million). Cabot balked. Taxpayers in neighboring Montrose, worried that they might have to foot the bill to share their water with the waterless, balked. And finally, in December of 2010 – two years after their water went bad – DEP bailed. They compromised, allowing Cabot to "promise" payments totaling $4.1 million to the affected residents. The media, says Victoria Switzer, makes it sound like the affected homeowners reached an acceptable resolution to the water problem. But it’s DEP that’s reached a resolution with the gas drilling company. Switzer explains that DEP and Cabot Oil and Gas concocted the deal behind closed doors – a deal that replaced the promised and approved water line with silver. The media reported that the issue was resolved with a consent order. But, says Switzer, “We were not consulted or included in this agreement.” The consent order, she points out, was simply an arrangement between DEP and Cabot’s lawyers. Today, twenty-six months after the initial explosion, these residents are still without water. They rely on delivered boxes of water and water buffaloes. If they take the money, the water delivery stops. With no water, they can’t sell their property – except for a fraction of its value. With no money, they can’t move. And where would they move, anyway? Refugees from contaminated shale areas are having a tough time finding houses to rent – the price of housing has skyrocketed in the past year. Then, too, with the intensity of industrialized drilling in the area there’s always the risk that any new house they buy could end up with a gas well in the back yard – or methane in the drinking water.